Hello, friends! 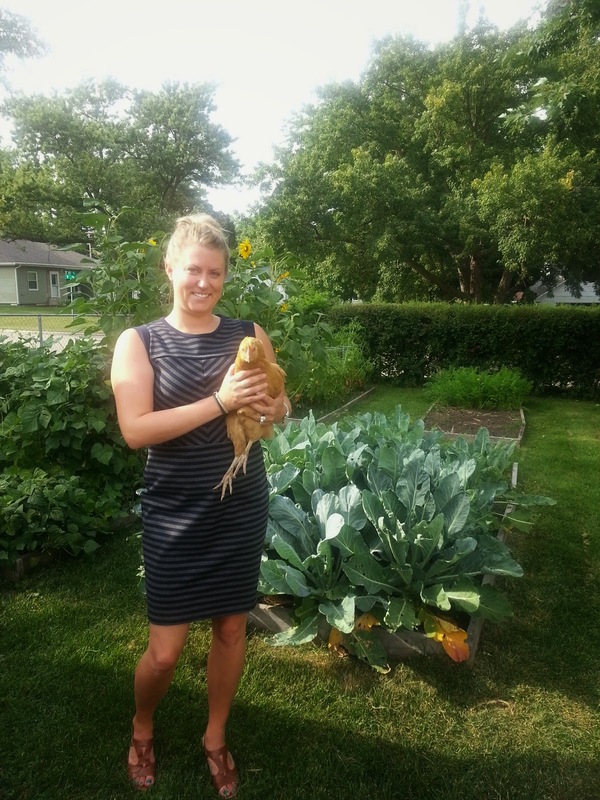 I’m Kelli, and I am here from The Sustainable Couple to share some tips about feeding your backyard chickens on a budget. My husband, John, and I have had a small flock of chickens for almost a year. 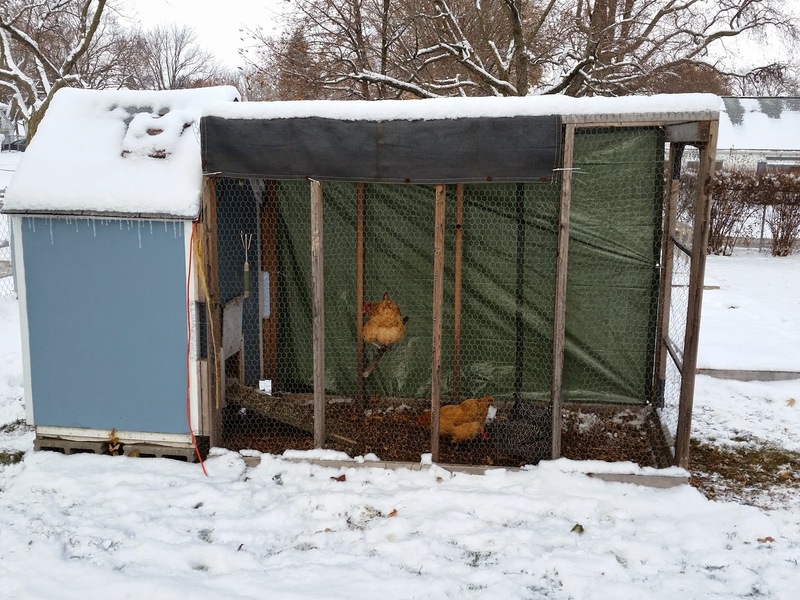 Our city had an ordinance prohibiting backyard chickens for many years, until we successfully led the charge to change that ordinance. The city council voted to allow yard birds…after 4 months of research and meetings. It was a long process, but totally worth it. Because we get eggs. Duh. Now, one thing John and I quickly learned was just because you have chickens in your backyard, doesn’t mean the eggs are free. Heck, it doesn’t even mean the eggs are cheaper than the grocery store. This bit of information is clear: Organic, free-range, homegrown chickens and their eggs will never be cheaper than the grocery store (for us anyway). That doesn’t mean we can’t save a little money and still feed our ladies quality food, even in the middle of winter. 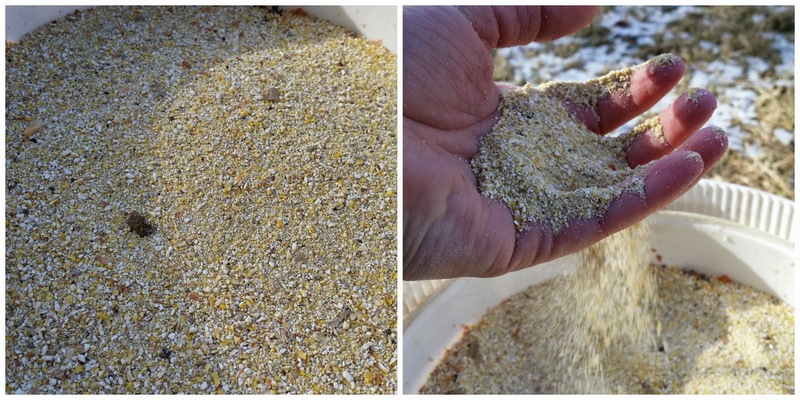 We purchase organic layer feed from our local farm store, using egg money. This feed and clean water is available 24/7 in a wall feeder in the coop. We are lucky that our local farm store carries an organic variety of chicken layer feed, as well as organic chick starter and meat bird feed. The feed runs us about $20 a for a 40-pound bag and lasts about 3 months for 4 birds. 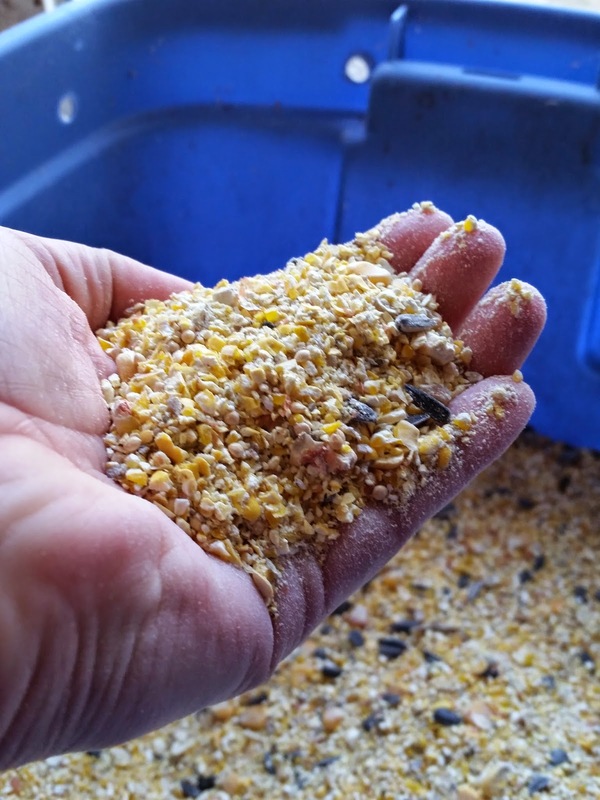 When we first got our birds, I mixed grit and calcium into their feed. Now I realize there are ways to supplement in those areas, too. Read on. THE LADIES GET TABLE SCRAPS. We have a nice little compost bucket on our kitchen counter that sits right between the sink and the backdoor. Nearly all food scraps go into this compost bin and are emptied once a day in the chicken run. You would be amazed at how much these girls can put down, and how awesome it is that these scraps aren’t heading to the landfill. There are some things chickens shouldn’t eat (GO HERE), and those things go to our backyard compost bin. FREE RANGE THOSE BIRDS AS MUCH AS POSSIBLE! 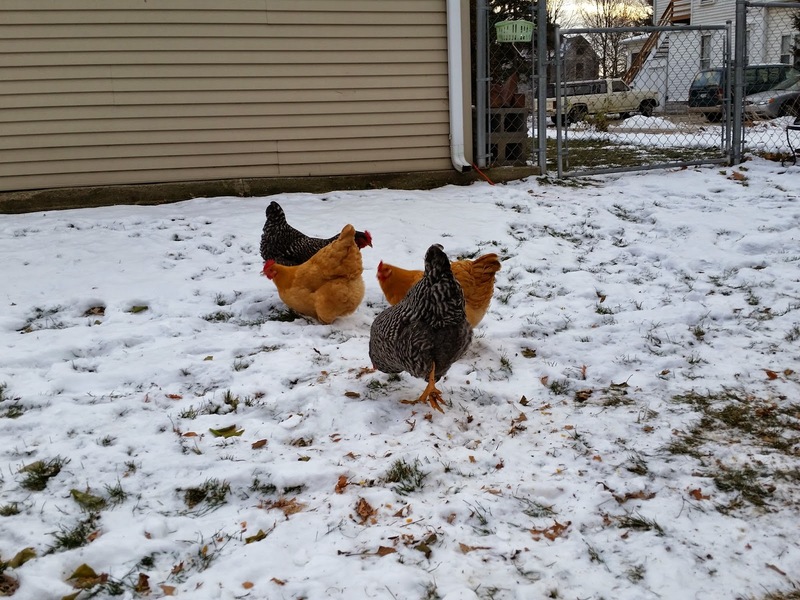 One way to supplement a chicken’s diet, and to ease your feed bill, is to get those girls out in your yard, even in the snow! They will pick up bugs and weeds – valuable for their balanced diet – and will also be happier and healthier by getting a little exercise. The nature of the bird is to free range and if you can provide them that opportunity, even in the winter, they will naturally supplement their own diets by foraging. 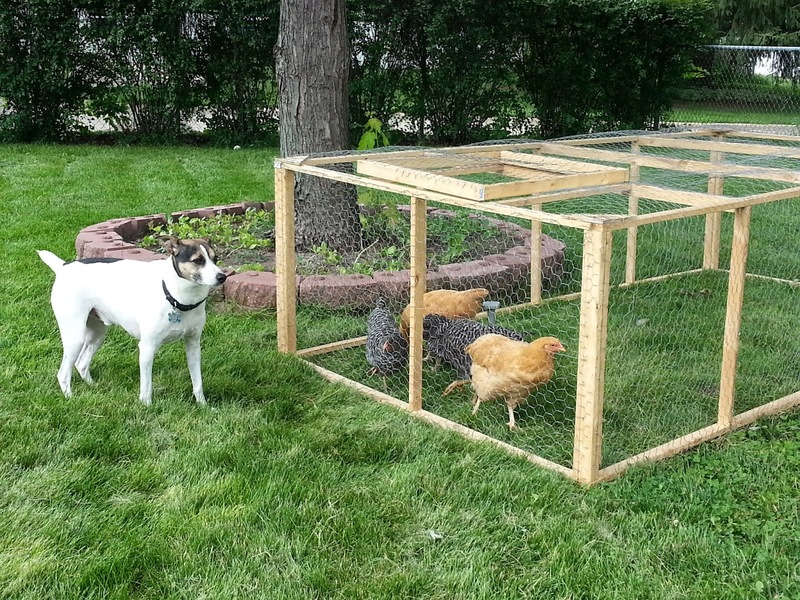 If you don’t have a fenced yard, or your birds are still young and you’re not sure if you can trust them, you can make or purchase a movable chicken tractor. We made ours from leftover chicken wire and wood from the scrap pile. We use this in the summer when we free range our ladies in the front yard. If you are free ranging your birds for a good amount of time in the yard, they will easily pick up pebbles and grit as they forage. There’s no need to spend a few bucks on grit to mix in with their food. We didn’t know this at first, and mixed grit into their feed each day. FEED THEM THEIR EGG SHELLS AND SAVE ON CALCIUM. Chickens can eat egg shells! In fact, it gives them an extra calcium boost and makes their shells stronger. Calcium, also called oyster shell, is kind of expensive and must be mixed in with the feed. At our house, all egg shells get crushed and put into our kitchen compost bin for the girls. It’s fun to watch them fight over the egg shells when we dump the bucket. And no, we don’t have any egg eaters as a result. TALK TO YOUR LOCAL FEED COMPANY ABOUT DAMAGED PACKAGING. 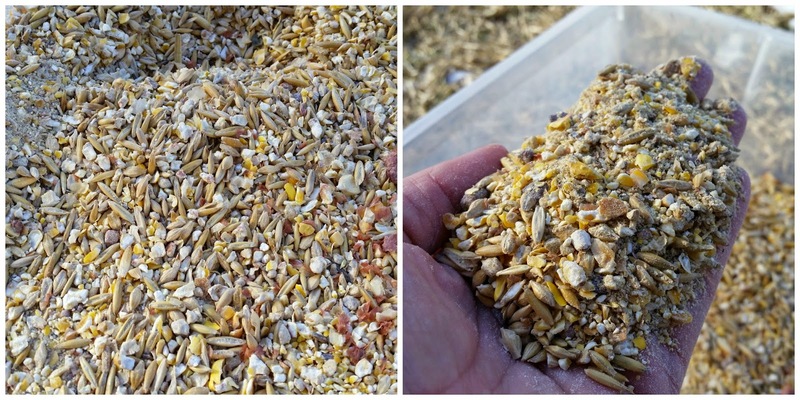 If you know someone who works at a feed company and you aren’t too concerned about feeding a 100% organic diet, you might consider contacting the feed company about their damaged bags of bird seed and feed. This stuff is perfect for a scratch treat! On occasion, our local feed company will have ripped or torn bags of general or all-purpose bird seed or feed that they must throw away. Instead, John and I score a 50-pound bag every year or so to feed to our chickens as scratch. Sometimes we have to purchase the seed at a very deep discount, other times it’s free. GET CRACKED CORN FROM A LOCAL FARMER FOR SCRATCH. We know several farmers who we feel comfortable visiting each fall around harvest time for a few 5 gallon buckets of cracked corn. Under the augers, bins, and grain dryers at a farm you’ll find little piles of cracked corn that is crushed as it passes from one spot to the next. This cracked corn usually goes to the farmer’s animals or to birds and other wildlife. Farmers in our area are more than willing to let us take this cracked corn for free for our chickens. We mix it with their feed (if we need to stretch it a bit further) or simply scatter it in the lawn for them to scratch at. How do you feed your backyard chickens on a budget?